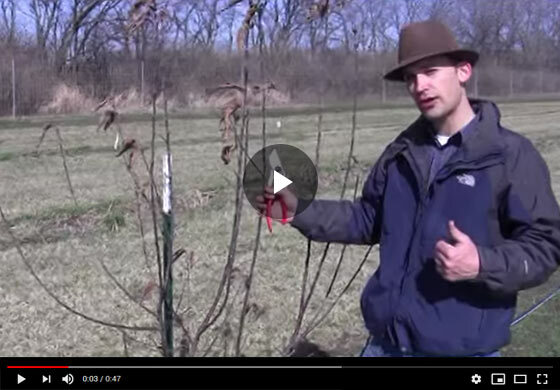 Felix from Gurney's shows how to prune an apple tree in its third year of growth. Find out how to create a central leader, how to promote secondary scaffold development and properly develop the overall framework of your apple tree. Hi, Felix here with Gurney's, today we're going to talk a little bit about pruning an apple tree. This is a younger tree here that is in its third leaf, its third year after planting. So we planted this in spring. one year it grows, second year it grows and this is the beginning of our third season. We have a lot of vigor here, you look down there's a lot of shoot development, we have some fruiting buds at the tips, some spurs developing, so it's a nice situation here for some fruit production. All we want to do pruning wise, is to take these lower branches off, cut them flush. They're just too low, they're going to be hanging into the way of the bore and they're going to be shaded by the branches growing above. These downward going branches are always cuts that we want to make because they're going to be shaded underneath that lip. Then the other consideration here is that we have a central leader, with apple and pears, most the time, will prune them to having a central leader so you can have a base scaffold generally at about 24 inches or so, or maybe a little higher, depending on your preference. Then you have another sort of scaffold, these are the branches that come out of the main trunk, we want three or four nice, well spaced scaffolds and here we have, this is kind of our leader, it's not as obvious in some varieties or some apples, but it is the most upward growing shoot here so we want to encourage that to be our primary leader and this one here is going to come off because it's competing, we've taken that out and then this branch is not going in the direction we want it. So basically, we've taken this tree, encouraged a central leader to form the final cut, as we've shown in some of our pear videos to stimulate our secondary scaffold, which we wanted to have happen right about at shoulder height in this example, and I'm going to cut a slant cut right behind the bud, this is going to continue to be a leader so by cutting that back it's going to stimulate the bud four inches below that cut, all these pots will wake. This heading back cut stimulates that bud break. So this one's going to continue to be a leader, and our hope is that, because we're forcing these buds to break we're going to get our secondary scaffold development right there on this framework. The lower branches, the first scaffolding which we basically just have to in this case, those can fruit a little bit this year on this tree, get us some nice crop and then we'll continue to develop the framework.